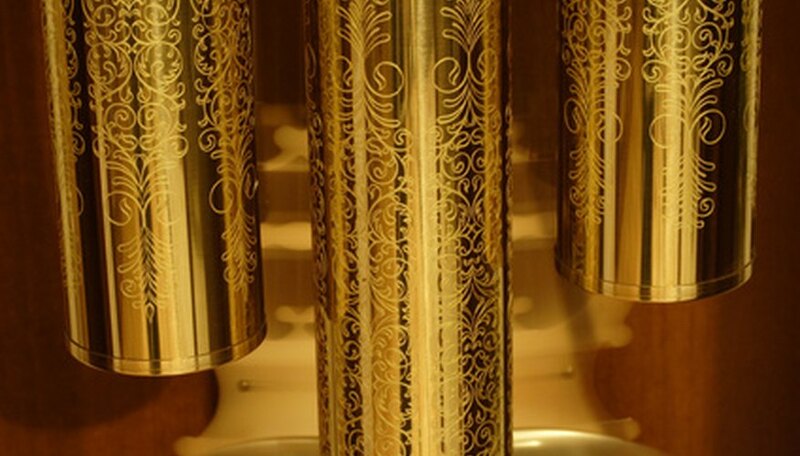 A Pearl Grandfather clock has inner and outer mechanisms that synchronize together. If one part of the clock is faulty, it can cause other parts of the clock to malfunction. These types of clocks are known for their pendulums, weights and chimes that need to be adjusted. Confirm that your Pearl Grandfather clock is level. Always work on a clock in the place it is meant to be on display. Moving a Pearl Grandfather clock after adjustments may mess up the alignment of its weights and pendulum. Place a small piece of carpet or wood under the footing of the Grandfather clock if it's off-balance, and check that the clock is leaning against a flat wall surface for support. Take a small pair of pliers, and open up the side panel of the Pearl Grandfather clock. Examine the weights to see if they are in the right order. Look on the bottom of the weights to see where they are marked "Left," "Right" and "Center." Adjust the weights if they are twisted. Raise the chime bar if the chimes are hitting the weights. Make sure the chimes work properly once everything is adjusted and that the weights are properly leveled. Look at the lever on the chime dial, if there is a problem with the weights not falling in place. Make sure that the chime lever is centered, and that the chime bar is not in the "Up" position, prohibiting the weights from falling correctly. Wind the Pearl Grandfather clock daily, making sure not to over-wind it. Set the minute hand on the hour you want the clock to chime, turning it counterclockwise. Wait for the clock to chime. Wind the big hand around once, resting it on the 12. Fix the pendulum once the weights are adjusted. Make sure the pendulum is hanging correctly, with the lower pendulum bob facing the front. The shiny side of the pendulum bob should always be facing outward. Make sure the pendulum swings correctly. A faulty pendulum prevents the time train in a Pearl Grandfather clock from moving, interfering with its inner-gear mechanisms. Look inside and examine the spring. Oil the spring at the pivot points, so that it runs correctly and with less effort. Replace the spring if necessary. Place a small amount of clock oil on the gears of the clock, where the parts rub in sections. Oil a Pearl Grandfather clock at least once every three years.